When it comes to exterior paint design, it takes more than state-of-the-art equipment and the industry’s top materials. It also takes expertise. With over 280 years combined experience, M Exterior Creations’ 12-person team took Show Coach #1225 from conception to unforgettable. 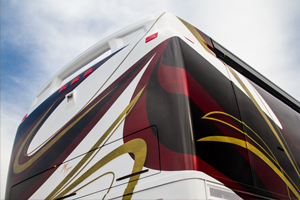 This Prevost X3-45, in shades of gold, merlot, black and white, showcases edgy whirls and billows enhanced by complex special effects. From turning heads to inspiring true adventure, this 2016 Marathon coach is one of a kind.